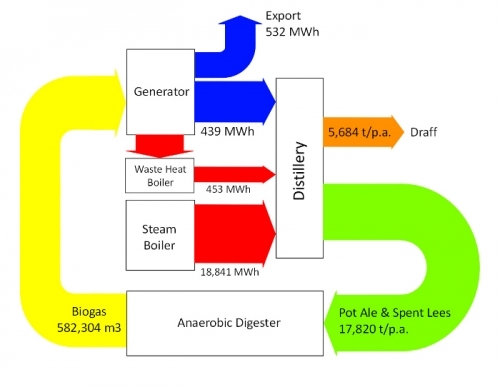 Here is a tasty one … The Scottish whisky distillery of Balmenach has worked with the Energy Systems Research Unit at Strathclyde University in Glasgow to investigate the potential energy production from Whisky distillation co-products (such as draff, pot ale and spent lees). More information on this case study can be found here. 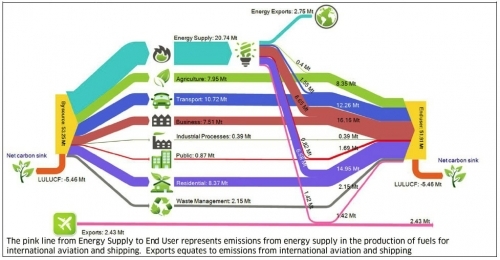 Here is the Sankey diagram from this case study. The study concludes that it would be advisable to feed the liquid co-products to an anaerobic digester to produce methane. A power generator can use this fuel to meet the electricity demand of the distillery, the surplus could be fed to the grid. Exhaust gases from the generator can be utilised by a waste heat boiler to offset the steam requirements of the stills. This would result in an annual economic benefit of £178,450 and a payback period of 5 years. The Sankey diagram shows electric energy in MWh, co-products in tons per year, and biomass in cubic metres. Hence, these flows must not be compared to each other. I am unsure about the red arrow from the steam boiler to the distillery, which is labelled ‘18,841 MWh’ as it doesn’t seem to be to scale with the other energy flows. Anyways. I like this one. 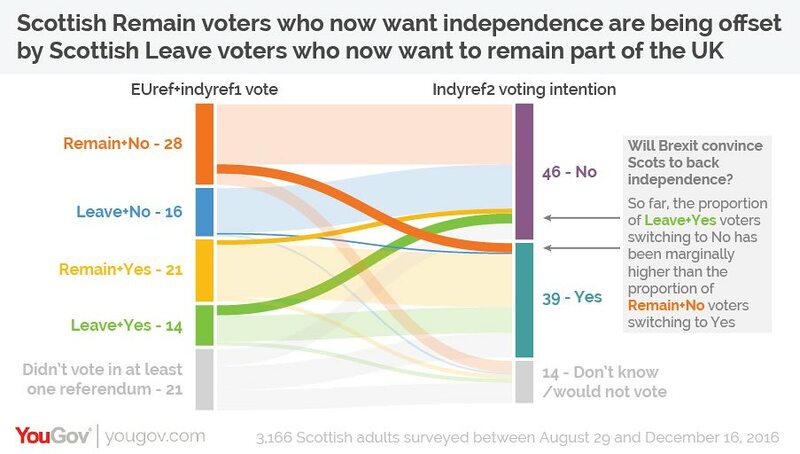 Here’s tae us, wha’s like us? Damn few, and they’re a’ deid. Scottish Executive publishes the Energy Report for Scotland as a web only publication. Apart from it being an interesting read, it contains a number of great Sankey diagrams (figures 18 to 22). I am reproducing one below, that pretty much has the same purpose as the one I showed in a previous post for the U.S.